week of events, building up to Sunday's game. As I got to the top of the escalator at Camden Town, the station exit was far more packed than it should have been on a late Tuesday morning. Perhaps more surprising, for the casual observer at least, was that the majority of the traffic clogging the ticket barriers was comprised of young schoolchildren, most of whom looked to be no older than twelve or so. Personally, I had my own theory as to why these kids were doing their best to disrupt the flow of commuters attempting to enter the station, one which was confirmed by what one must hope was their teacher, raising his umbrella and leading the children towards Regent's Park – and just happened to be wearing a Redskins hoody. 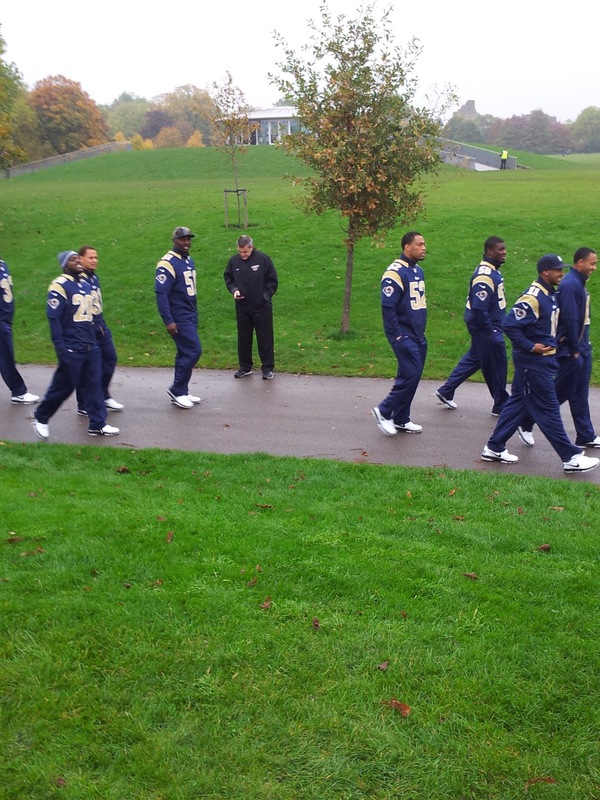 Clearly, this was one of five delegations from different schools in the area invited to take part in the first event held by NFL UK in the run up to the sixth International Series game on Sunday, a special British edition of the NFL's Play 60 initiative – to be run by the entire St. Louis Rams roster. Just like in the NFL Network adverts! Making my way over to The Hub, the largest sports outdoor sports facility in London, situated in Regent's Park, I noticed a few people wearing the odd item of NFL gear – a Cowboys t-shirt here, a Saints cap there – though whether it was by coincidence, or they had learnt about this Play 60 event and were coming along to watch, I can't be sure. The day was meant to kick off at 11:30, though some of the schools had arrived early and were running about, wearing their Rams-themed Play 60 t-shirts. 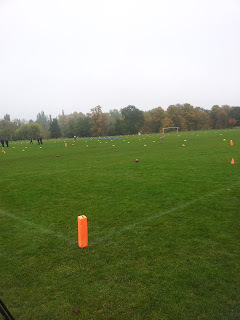 Looking over the playing fields, marked out with cones, endzone pylons and jumps, I found myself amused at how the NFL staff had transformed a football pitch (or 'soccer field', if you're that way inclined) into the layout seen in those infernally-catchy 'bus' adverts for Play 60 on NFL Network. As half-eleven rolled around, a man in a red polo began shouting instructions through a megaphone to the kids to warm up and stretch. Red Polo Guy, as I'll now be referring to him, would reiterate with each new group of kids that they'd be working with “Fred Taylor from the Jacksonville Jaguars and Isaac Bruce from the St. Louis Rams, former players in the National Football League”; I couldn't help but wonder if it was a first for Taylor and Bruce to receive such blank stares from the children they were helping. It was a thought that kept surfacing in my mind throughout the event, especially once the current Rams had arrived – how odd must it have been to run this Play 60 event as they often did Stateside, but instead of the stares and cries of adulation and near-idol-worship that NFL players might expect to receive from schoolchildren, to be received with little excitement by a group of kids who didn't know them from Adam. Most amusingly, as the children from one school approached the field, they seemed far more excited about what was contained in the free packed lunches lined up under the marquee than they were about the event itself! Red Polo Guy, Taylor, Bruce and several volunteers took most of the kids (but not all) through various exercises and drills, only a few of which involved the use of an American football. The one that caught my eye the most was a game that was a cross between passball and ultimate frisbee, as it was the only one that bore any semblance to the game of football. It was quite clear that, for all the success the International Series has had, the game still hasn't taken root at the true grass-roots level – the youth of this country – as almost every single child threw the ball as you would a shotput, and none of them knew the correct hand positioning to catch the ball correctly. If the NFL were hoping that this event would have been a showcase for the in-routes the sport has made in this country, they will have been sorely, if not embarrassingly, disappointed. 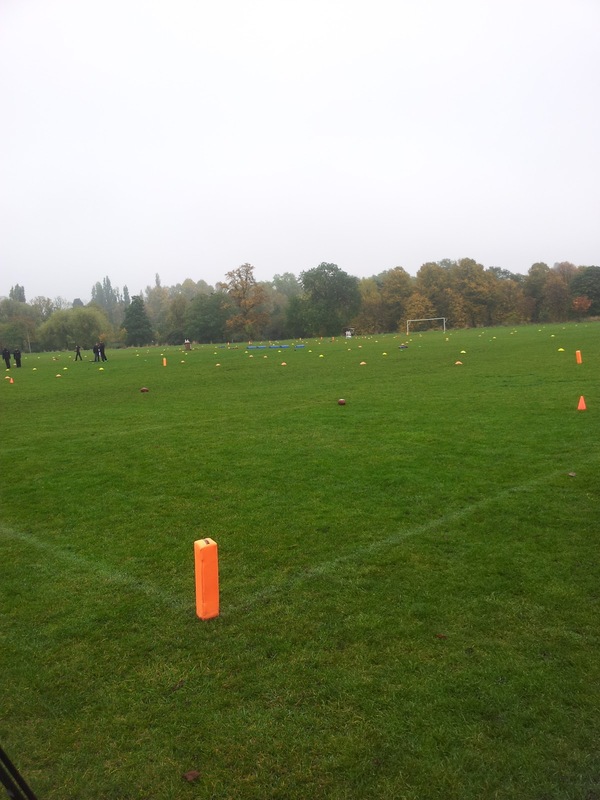 As I mentioned above, most of the children participated in the active drills – but not all. I try not to get too political, but it appeared to me that very few of those participating in the exercises were girls. Most of the girls that were there (or so it appeared to me) were clad in cheerleading uniforms, and were taken off to the side by some of the Rams' cheerleaders to work on some cheering drills. While cheerleading is a huge part of sports culture in America, and one event was hardly going to do much to break down societally-enforced traditional gender roles, it is curious that, at an event designed to encourage kids to be active and healthy, the girls (or at least most of them) were pulled aside and went to work on a cheerleading routine instead of taking part in exercise. Am I reading too much into this? Probably, but there we are. (While we're at it – the NFL really sold advertising space on the cones they used for the event? That really took me aback, especially as they proudly proclaimed “KINNECT ON XBOX LIVE” - surely the antithesis of the 'put down the controller, go outside and play sport' ethos of the Play 60 initiative?) Again, I'll reiterate that this was only how it appeared to me - there may have been plenty more girls taking part in the exercise that I didn't notice, but this was my perception of it. Rampage, using a child as a leaning post. Being a children's event, there was, of course, an appearance by Rampage, the St. Louis mascot. Rampage got involved with some of the exercises (or rather, comically disrupted them), posed with the girls at the conclusion of their cheerleading drills, and spent some time with a child in a wheelchair who had also been invited to the event. 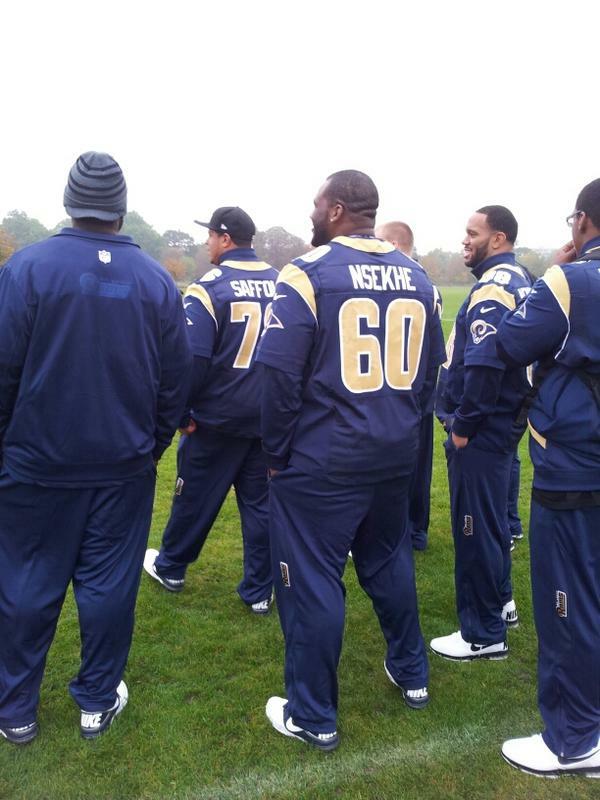 The Rams players were scheduled to appear at 12:30, but were delayed. 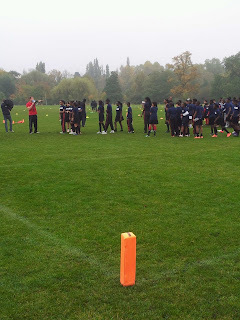 The schoolkids continued with the drills regardless – I wondered if they would get tired out before the players arrived, robbing the NFL of their photo-op – but they seemed to have plenty of energy when the team finally emerged from an entrance built into a small hill next to the fields and came along the path, donning their Nike jerseys over long-sleeved tops. As the players took to the field, DE Chris Long immediately broke off from the rest of the players and walked straight up to the wheelchair-bound kid, and spent several minutes talking with him. It was a nice gesture, in some ways heightened by being the only player that I saw to go out his way to do so. football instead of a disc. 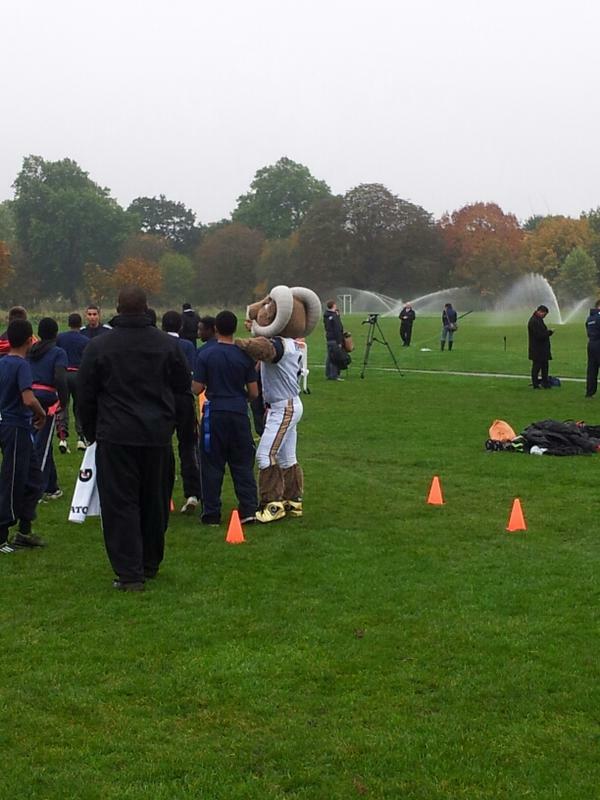 Some of the Rams took over from some of the volunteers in running the drills, while others stood at the side, chatting and laughing among themselves while cheering on the children. Perhaps surprisingly, most of the O-line spent this time watching the ultimate-passball drill, breaking into applause at one particular catch, and giving a few collective hoots of exaggerated disappointment at the many, many, many incomplete passes. Most likely due to the team being late, the exercises only continued for another fifteen-or-so minutes before the schoolkids were called together to a huddle in the middle of the field, breaking down on “Play 60!” before dispersing with those packed lunches they found oh so engaging earlier. With the kids off the field, the players were told that they could go get a drink from the tunnel in the hill they had come from earlier, but few did. Instead, they remained on the field, some on their own, others in small groups, as we were finally allowed to walk amongst them to for interviews and quotes – you can find the answers to our questions here – until the children returned for another session of exercises, albeit one that only lasted around half an hour. 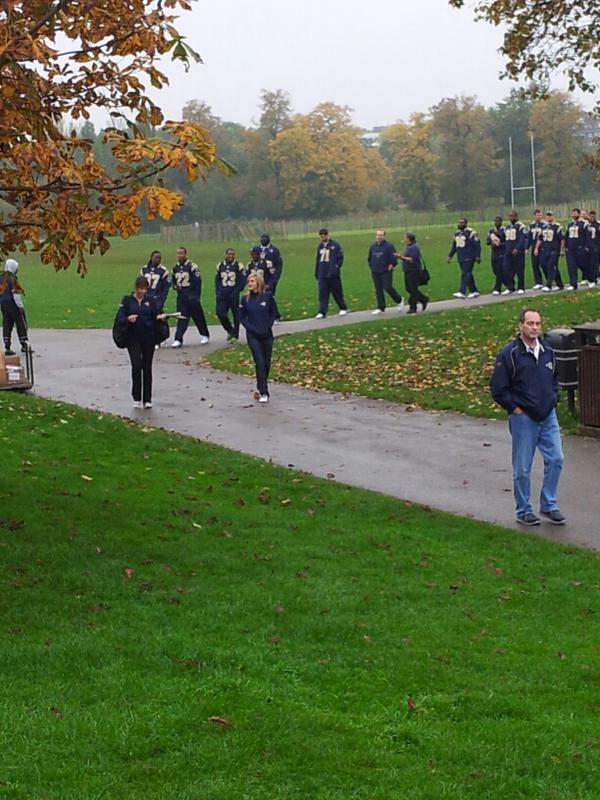 After getting another interview or two with some of the Rams players at the sidelines not taking part in running the drills, Red Polo Guy announced that the Rams would be leaving. 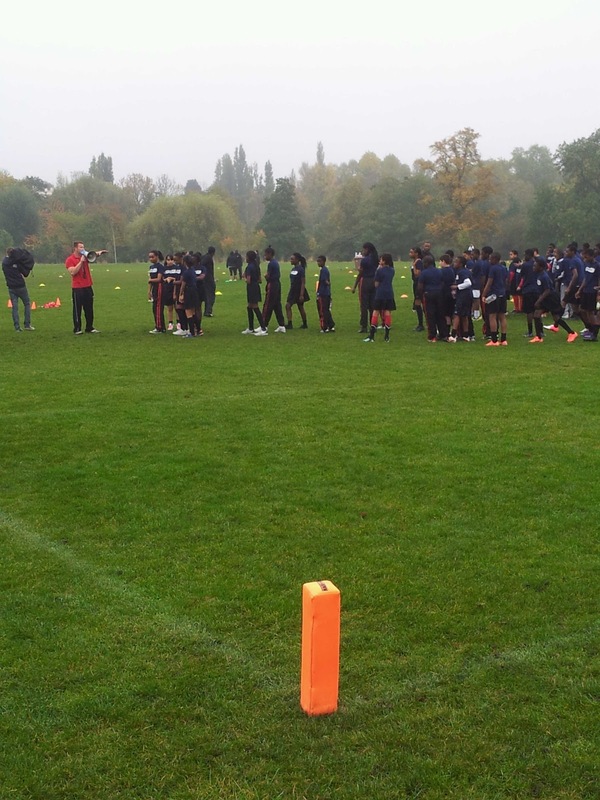 The players made their way off the field while the kids remained kicking or attempting to throw footballs for a while longer before the teachers herded their pupils back towards the tube station.